This entry was posted in Food Trucks And Catering and tagged Catering, Food Trucks on April 6, 2018 by Roadside Kitchens. A corporate party is a great way for your employees to feel appreciated and a brilliant opportunity to wow potential clients. 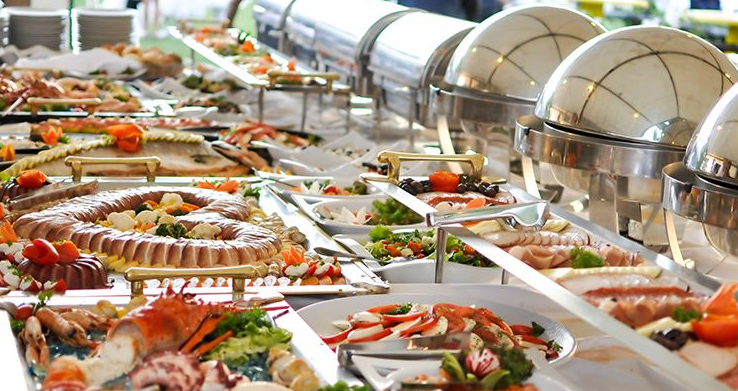 It’s always the food that they remember they most, which means extra pressure on you to get the menu right down to the T. It’s a great idea to look for a good party catering service for professional advice. For parties, don’t offend your guests by just serving tea and biscuits, and don’t blow the entire budget on a 7-course deluxe buffet. 3-course meals together with the right menu form the perfect choice for any party dinner. BBQ skewers and salads are an old classic, but you can always spice things up with stuffed peppers or add a quirky touch with sliders and canapés. If you have enough wiggle room with a larger budget, shrimps and scallops make for a unique, classy and tasty palate. Vegetarian or all-meat? Sweet or spicy? Healthy or deep-fried? The possibilities are endless, which might ending up really confusing you. Make it easier on yourself by having guests select the menu when sending out the invite or juggle flavours with a variety of ethnic dishes. Some guests might have religious sensitivities with regards to certain foods or may have allergies, so be sure to include at least one dish that is safe for them to chow down on. Its best to include at least two choices in your dessert menu, one for the health-conscious and one for those with a sweet tooth that trumps the fear of calories. Consider chocolate fountains that’ll add a little life to the party. But of course, you can’t leave your guests parched. Refreshments are a necessary part of any meal and should accompany the main course. You can offer both alcoholic and non-alcoholic drinks, but tea and coffee seems to be an old favourite for most corporate events. Food can’t look good on its own. Presentation counts and for your corporate event, it might be a major factor in cementing a great impression. Fancy, stylised salads are always a delight but arranging the dishes themselves in various ways can create a lovely effect. Decorative elements like flowers and frilled table cloths would also complement the arrangement. Try to stick to a fixed color theme throughout the venue. Where you hold the event and the number of people attending will be key in determining the layout of your event. Banquet-style setups make conversations between groups easier and allow for interesting ways to decorate the venue, but they tend to take up a lot of walking room. A buffet-style layout lets people walk around and mix freely, but causes crowding and long waits at the buffet line as some folks tend to hang around where the food is. Consider having multiple tables to avoid packed lines or go vertical instead: vertical arrangements take up even less room and look very fancy. When you just have a lot on your plate already, it’s not a bad idea to get experts to handle the party catering for your corporate event. This entry was posted in Food Trucks And Catering and tagged Catering, Food Trucks on March 27, 2018 by Roadside Kitchens.